The Tackling Discrimination In The East Project is Funded by National Lottery Reaching Communities Fund until August 2019. If you think someone is discriminating against you, come and see us. Our team of experts can advise you on how to tackle the problem using complaints, grievances, and litigation. Very strict time limits apply. You have only 3 months from the date of the discrimination to start a claim in the employment tribunal and only 6 months in relation to education or goods and services. Make an appointment to come and meet one of our team of experts, or get advice by phone or by email. Our office is wheelchair accessible and interpreters are provided if required. 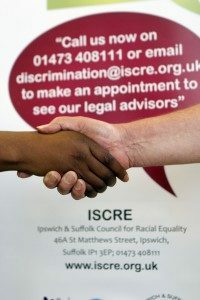 We are holding monthly outreach clinics in Lowestoft, Haverhill, Thetford and Norwich (the last kindly funded by Norfolk Community Law Service). Contact 01473 408111 for details. We are planning workshops to make people aware of what unlawful discrimination is and what to do to tackle it. Contact us for details. 1. When someone treats you worse than they treat other people because of a “protected characteristic”. 2. The effect of certain rules or policies imposed by an employer or service provider has a worse impact on one group sharing a “protected characteristic” than on others; and these rules/policies cannot be justified. Discrimination is unlawful at work, at school and in relation to anyone providing goods and services.